– My earliest memory of cyclocross is tied to how obscure the sport once was. It was the late ’80’s, my grandparents lived an hour north of NYC in Cornwall. It’s a beautiful town on the Hudson, just on the other side of West Point. It’s tucked in by roadie delights I was discovering for the very first time back then: The endless hills of 9W (‘…the W stands for ‘wicked”), the brutality of Bear Mountain. As I recall, Cornwall was also the home of a tiny shop called the ‘Bicycle Doctor’ -- the sole sponsor (and employer?) of a cyclocross terror named Jan Wiejak. If you look in the record books, he only won Nationals in ’94 and ’95. But the story, if I remember it correctly, is that Wiejak destroyed fields for the better part of a decade leading up to those years, but he was deprived (or stripped?) of Stars & Stripes jerseys when it turned out he was Polish, not American. He only won his first jersey in ’94 since he’d changed his citizenship just days before the race. The late 80’s were the Dark Ages of American ‘cross, as proven by an anemic race calendar matched by anemic field sizes, and perhaps affirmed by what I recall was the severe punishment meted out by Wiejak wherever he went. My memories for the details are fading. The little I ever knew was based in coincidence: He lived close to Cornwall. Yet from these origins has erupted what’s probably the most unlikely phenomenon in the last 20 years of US bike racing: The widespread embrace of ‘cross and its emergence as The New Rugby. Cyclocross is part sport, part social spectacle. The racing itself doles out wicked pain, but in character it’s worlds apart from the grim suffering of the road. Even at the most elite levels, inclusion and celebratory debauchery are the rule. Who doesn’t have a story of a friend whose personality completely changed thanks to their love affair with ‘cross? The sport & the culture -- they’re inseparable and they’re transformative. It’s an annual Winter of Love. It’s a Bohemia of the scruffy super-fit. Back in the late ’80’s who would’ve envisioned the ‘cross explosion? It was a thought I had last week as I stood at the start line of a local time trial. Like ‘cross, if you pin on a number for a TT you’re guaranteed agony for the duration. Other similarities came to mind: If you don’t have 4 hours to spare for training rides and if your tolerance for traffic is on the wane, ‘cross and TT’ing are alternatives to the perils of the road. They make different sorts of demands, but they get you a full-on racing fix regardless. Time trial explosion, anyone? Wouldn’t that be a foolproof way to expose the masses to the sweetness of racing a bike? One of the great charms of ‘cross is that, unlike the road, it celebrates racing-on-the-cheap. (Don’t the top US pros all ride SRAM’s budget Rival group?) Put a Merckx category in every TT. Hell, put a Merckx category at Nationals. There’s your cheap, since it negates the need for funky bikes and spendy carbon wheels, etc. With simple, affordable bikes comes more widespread accessibility to the sport as a whole. Time trialing is solitude like nothing else. A road breakaway isn’t the same. Being isolated in ‘cross, too, is also less-alone. By nature is the act anti-social? There’s a collective joy surrounding a ‘cross race (after all, it’s the genre of cycling where the tifosi & the racers are so close to being the same.) 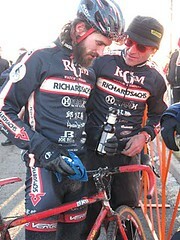 Is time trialing too monk-like to pull together likeminded people in a similar sort of waffles-beer-and-war-stories way? Without that social aspect, is time trialing forever banished to its current dark corner as Track Racing +1? – In terms of the crossroads of top-level bike racing and US mass media, the most brilliant thing ever conceived was back in 2003, known as ‘The Lance Chronicles.’ It was sufficiently touchy-feely for the majority (those keen on Lance but ignorant of racing), yet it divulged just enough detail to tantalize aficionados of all things PRO. The series was all things to all people, exactly what you’d expect based on the fact that it was produced by Nike’s consumer marketing psyops people -- the same folks who brought the similarly juicy & swoosh-seeded ‘Road to Paris’. It could’ve (and perhaps should’ve) inspired a broader mass media push into cycling/lifestyle programming, but thanks to a half-decade of ‘Doping! Doping! Doping!’ headlines and a lack of telegenic personalities post-Lance, we’ve seen none of it. 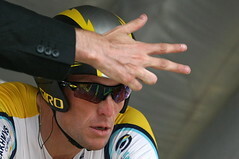 The bent of Planet Armstrong is directed more to racing fans, and less to those whose interest is foremost Lance-the-personality. That being said, each episode brims with stuff that would otherwise go unseen. If you’re not a Lance fan, it won’t turn you into one. But there’s plenty to amuse and entertain nonetheless. – Some inspiring photos here. In checking them out, though, it confirmed a growing suspicion. Let me preface my remarks with the fact that nobody is less of a photographer or a photographic connoisseur than moi and that my only argumentative tippy-toe to stand on is that fact that I try to be somewhat attentive, so call me out if I’m totally wrong…That being said, has there been blitzkrieg lately of on-the-cheap filtering of bike-oriented photos all over the internet? It’s as though you can snap a photo, then jam it through a cheap equivalent of a Photoshop action to get a soft-light silvery vibe plus the rounded black shading in all the corners. (This is just one of the several filtering trends I’ve seen-and-seen-and-seen.) This is in absolute contrast, of course, to setting up lighting and lenses and all of the other highwire pre-shoot work once required (and artfully executed) by real photographers in a different era of photography. I have an iPhone and I’m well-familiar with Camera Bag and Hipstamatic and I don’t doubt other apps and programs exist. What it’s doing to photos all across the bike-part of the web, it’s maybe what would happen to language if the very linguistic existence of adverbs was an app, newly made available on iTunes for $1.99. A little modification-novelty goes a long way, and a lot of it overwhelms-and/or-destroys the thing being modified. Careful people!! Don’t be afraid to let nice photos stand on their own. 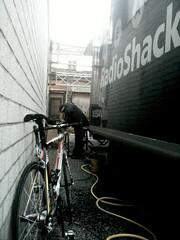 – I saw this photo and it reminded me of another necessity-is-the-mother-of-invention moment in pro cycling, ca. 1986 or so when Look first invented the clipless pedal and the pedals worked great, but the shoes in the marketplace were made with uppers way too wimpy for clipless. Because of this, Lemond rode clipless in his Patricks or Brancales or whatever they were, but he cinched Alfredo Binda toestraps around his shoes to keep them from getting too stretchy on the upstroke. I unearthed this photographic treasure trove looking for evidence, but I couldn’t find any. Can anyone help? – Is anyone else bummed by USA Cycling’s decision to move Masters Nationals to August? Let’s see, Masters racing is for folks trying to balance work, family, and the bike, and what’s the one month when pretty much everyone goes on vacation in order to chill and really tune into family life? August. For the last few years it’s been in late June/early July and was easy to schedule. Things get even more absurd in 2011. They’ve slotted the races for Labor Day Weekend then. Just when you think the deafness-to-rank-and-file-membership in Colorado Springs has peaked, they find a way to reach new heights.